The Fluke Calibration 5960A Triple Point of Argon System enables primary standards laboratories to realize the argon triple point using a consistent, reproducible process with the lowest uncertainty of any commercially available system. The Fluke Calibration system produces a 30-hour temperature plateau and provides multiple entrant wells to increase SPRT calibration efficiency and throughput. A number of technology advancements are designed into the Fluke Calibration 5960A system to achieve a low uncertainty of 0.25 mK. For example, the argon cell is carefully built with an ultra-clean process using 99.9999 % (six nines) purity argon resulting in an uncertainty factor from impurities of 0.015 mK. The deep, 480 mm immersion depth of the entrant well minimizes the effects of stem conduction to less than 0.01 mK and radial uniformity to less than 0.05 mK. 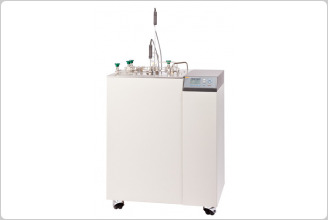 The 5960A system utilizes liquid nitrogen (LN2) in a Dewar vessel surrounding an argon cell to achieve –189.3442 °C. A digital controller combined with a heater maintains a temperature plateau lasting up to 30 hours with 0.1 mK variation without using complicated pressure controls. 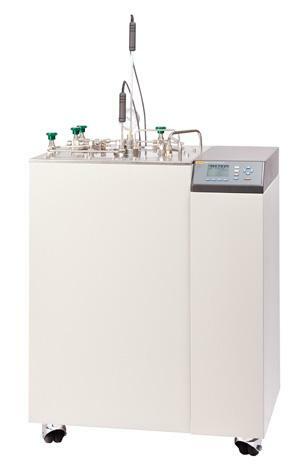 By regular renewal of liquid nitrogen in the system, the plateau length can even be extended to four days. The system’s long, stable temperature plateau lets you carry out your SPRT calibrations with better quality and more efficiency. Four entrant wells increase lab productivity by allowing you to calibrate four SPRTs simultaneously. The display panel of the 5690A provides a simple menu structure with soft function keys for setup and programming the argon system. The readout displays simultaneously the set-point temperature, actual control sensor temperature and percent heater power. The display is selectable in eight languages—English, French, Spanish, Italian, German, Russian, Chinese, and Japanese. Applying positive pressure with helium or dry nitrogen to an entrant well port prevents your SPRTs from being bound in the entrant well by freezing moisture. You can insert and remove SPRTs as desired from the system over the duration of a single plateau. Other systems require that you first melt the cell in order to add or remove an SPRT.